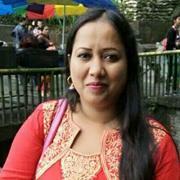 Find hundreds of Kharwar divorced brides on Matchfinder. If you are exploring marriage matrimonial sites India, you have landed on the right portal Matchfinder matrimony. If you are searching for divorced brides for second marriage,...Read More you have reached the right place. There are Kharwar divorcee brides with different backgrounds seeking alliances for second matrimony. Submit biodata to contact profiles on our Kharwar Second Marriage site instantly. Match finder matrimony is the right option when you are searching for list of matrimonial sites in India. For Kharwar NRI brides visit these pages!